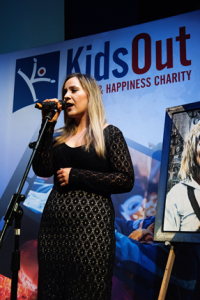 Home > KidsOut News > 2018 Glasgow Gala Dinner raises over £60,000! Click here to visit our Facebook page for photos from our Glasgow Question of Sport 2018 event! 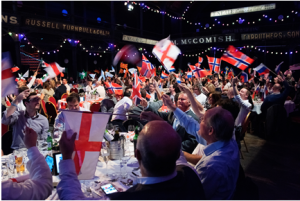 KidsOut’s 2018 Glasgow Question of Sport Gala Dinner was another great success, raising £60,000 for the charity. 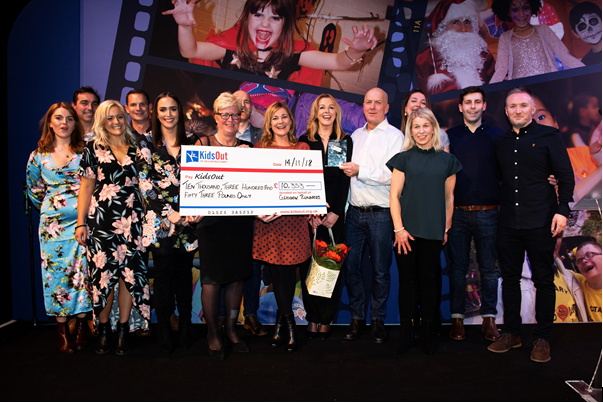 Over 300 people from Scottish-based companies joined KidsOut at The Old Fruit Market for a night of fun and fundraising on Friday 16th November. We were thrilled to have sports-presenter Peter Martin return to host the event and act as quiz-master, proving very popular with the guests. Those in attendance were also treated to a beautiful, exclusive performance of The Waterboys’ “How Long Will I Love You?” from singer Erin Henderson. Winning the quiz and claiming the coveted champion’s trophy was Catherine Henderson Design. Well-deserved victors! In addition to the main quiz, guests could also take part in a raffle and two auctions. There were some fantastic items up for grabs in the silent auction, including a voucher for a luxurious spa day for two at the Gleneagles Hotel, and two tickets to see Rangers in the Directors Box with a signed shirt included. Available in the main auction were four FA Cup Final Tickets with flights and overnight accommodation included, and the chance to host a private screening of a film of choice for up to ninety people at the Grosvenor Cinema. We are sure the winners and highest bidders of our raffle and auctions will enjoy their fabulous prizes. KidsOut was also presented with a cheque for £10,353 from the Glasgow runners, who raised this money through taking part in this year’s Glasgow Half Marathon. This is a fantastic amount to have raised, a huge congratulations to all the runners for their amazing achievement. 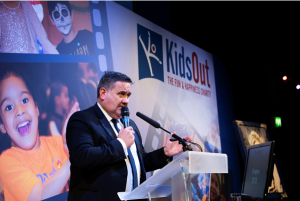 Each year KidsOut offer awards to four people or companies for their outstanding support and contributions to the charity. At this event, Pamela Hodgson, chair of the Glasgow committee, was presented with a “KidsOut Lifetime Achievement Award” on behalf of the Trustees and KidsOut Staff. Pamela has provided an outstanding and enduring contribution to KidsOut’s work and this award was meant to signify that her ongoing support does not go unnoticed. KidsOut would like to say a huge thank you to the rest the Gala’s event committee as well, as the Question of Sport event would not be possible without their help and support. The money raised will be used as vital funds to continue to supply Fun Days and Toy Boxes to disadvantaged children in Scotland, helping KidsOut bring fun and happiness to even more disadvantaged children. A special shout-out is also warranted for the volunteers from Badaboom Bars. Their help on the night was essential in ensuring the event was a complete triumph. The date of the next KidsOut Glasgow Question of Sport is Wednesday 6th November, 2019. Keep the date free in your calendars and be sure to stay up-to-date with our Facebook and Twitter pages for an official announcement soon.